On Saturday, the world celebrated Earth Day 2017. This one took on a different demeanor from Earth Days in our recent past. Reminiscent of the first Earth Day on April 22, 1970, this year it coincided with the international March for Science. On the same, annual date that we usually turn our thoughts to the health of our planet, people in more than 400 nations took to the streets to also march for scientific integrity. Science and Earth Day walk hand in hand, of course; you can’t separate the health of our air, soil and water from fact-based research. And I find that the coupling of our pale, blue dot with science to be the most visible when we look to what we’ve discovered from space explorations. 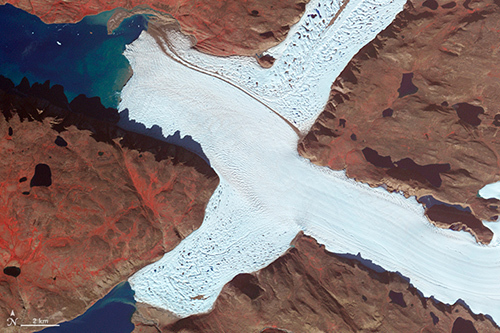 I recently came across a photo essay by Adam Voiland, science writer for the NASA Earth Observatory. A few years ago, while he was working on a story about wildfires, he examined a satellite image of smoke over Canada. 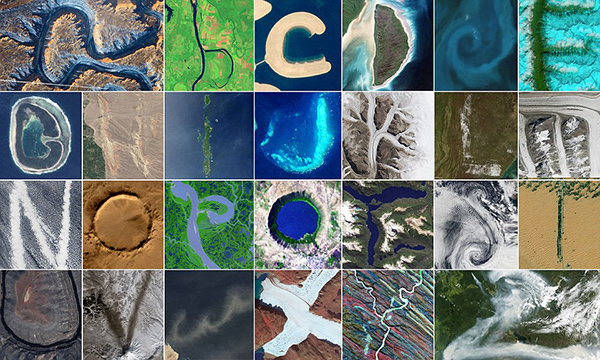 He was struck by how the plumes looked like the letter V. He wondered: would it be possible to track down all 26 letters of the English alphabet using only NASA imagery and astronaut photography? 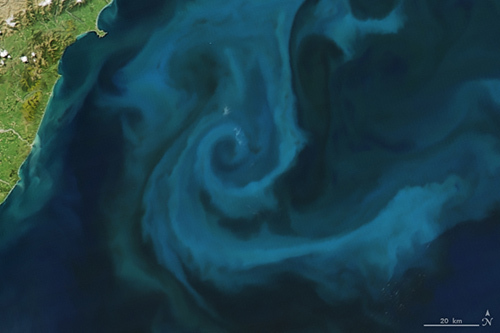 Voiland then sent out a call for help, asking his colleagues and readers to send him any images from space that they had where a letter of the English alphabet could be detected among the natural features. The photos streamed in; pictures of clouds, ocean reefs, phytoplankton blooms, river systems and other stunning natural phenomena. Some letters, Voiland stated, such as C and O, were easy to find. Others—A, B and R, for example—were more difficult. No one style was adhered to: some of the letters appear as if in their capital forms and some in lowercase. Some, such as the E and the P look to be cursive rather than printed, such as the C and the X. 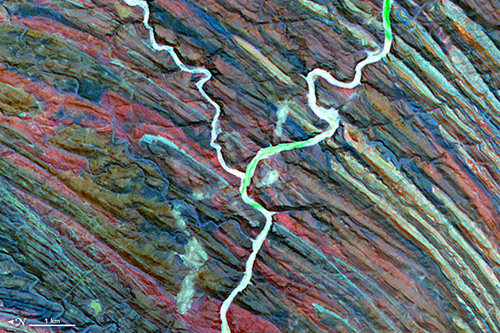 By the time he was writing the final captions for his gallery of natural art, titled Reading the ABCs from Space, Voiland had a son who was extremely fond of the classic Dr. Seuss books. So to add some fun to his space alphabet, Voiland included words that start with each of the letters and hyperlinks so that adults and children could learn more about the specific features, names and places. As any number of the various iterations of children’s alphabet books show, learning letters can be about gaining knowledge in other disciplines, as well. And with this photo essay, I think Adam Voiland is making us look at the Earth in a way that reminds us that there is so much more to the language of our landscapes than generic, overused terms, such as lakes, mountains or valleys. There are bowknot bends (under A), karst (under K) and polynyas (under P). And when we speak of things such as an “assemblage of rocks” or “a youngish underground river yearning for water in northern Namibia” (found under the letter Y), we speak of the natural beauty, processes and wonders around us. It brings forth that emotive thing that abides in our world as a whole. Just after this Earth Day 2017, you may want to take a look at this alphabet just for fun or share it with your children as another lesson in reading. But, maybe, just maybe, you’ll see this compilation as not only a list of individual letters but as a greater message: a communication sent to you, directly from the Earth. Only this time, it’s writ very, very large.